A Syrian Kurdish family fleeing the IS offensive in Kobane, arriving to the Cultural Center in Suruç, Turkey. 2014. Syrian Kurds refugees, fleeing the ISIS offensive against Kobane (Ayn al-Arab) in Syria, wait in line to receive food in a temporary refugee camp in Suruç, Turkey. 2014. A Syrian Kurd refugee baby, fleeing the ISIS offensive against Kobane (Ayn al-Arab) in Syria, lies on the ground in the cultural center of Suruç, Turkey. 2014. Syrian Kurds refugee children, fleeing the ISIS offensive against Kobane (Ayn al-Arab) in Syria, watches heavy machinery dig a ditch in the refugee camp in Suruç. Turkey, 2014. A woman in a refugee camp in the Turkish/Syrian border in Mursitpinar, gestures as shelling takes place in Kobane (Ayn al-Arab). Turkey. 2014. 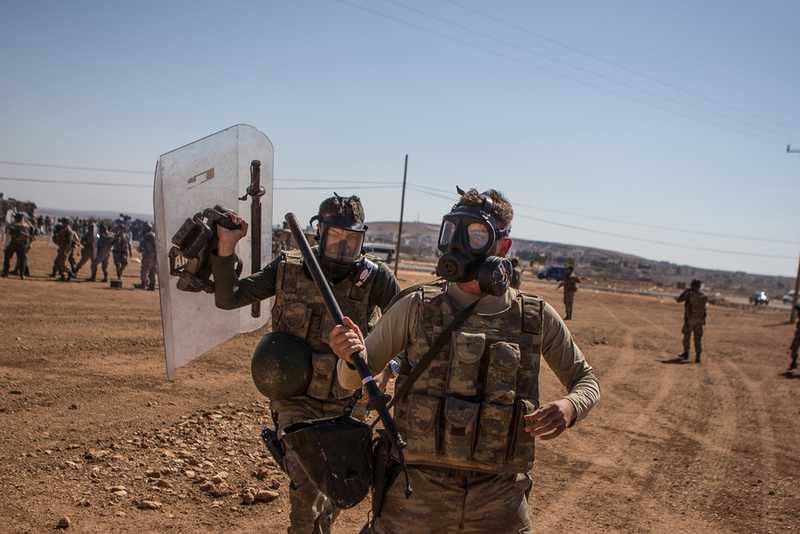 Clashes erupt between the Turkish Gendarmerie and Syrian and Turkish Kurds near the camp in the Turkish/Syrian border, as shelling takes place in Kobane (Ayn al-Arab) Şanlıurfa Province, Turkey. 2014. Clashes erupt between the Turkish Gerdanmerie and Syrian and Turkish Kurds near the camp in the Turkish/Syrian border, as shelling takes place in Kobane (Ayn al-Arab) in Şanlıurfa Province, Turkey. 2014. A group of Turkish army tanks are deployed in the Turkish/Syrian border line near the town of Kobane, where fierce fighting is taking place between the Islamic State and the YPG in Mürşitpınar. Şanlıurfa Province, Turkey. 2014. A woman watches the battle of Kobane form the hills near the border. Mürşitpınar, Turkey. 2014. Men walk and observe the battle of Kobane from the Turkish side of the border. Suruç, Turkey. 2014. A man sells bread in one of the hills, where people have gathered in the last weeks to support and observe the battle in Kobane, in Şanlıurfa Province, Turkey. 2014. A woman observes, the shelling in Kobane, in the Turkish/Syrian border in the west of Kobane, where people have gathered in the last days to support and observe the battle in Kobane, in Şanlıurfa Province, Turkey. 2014. 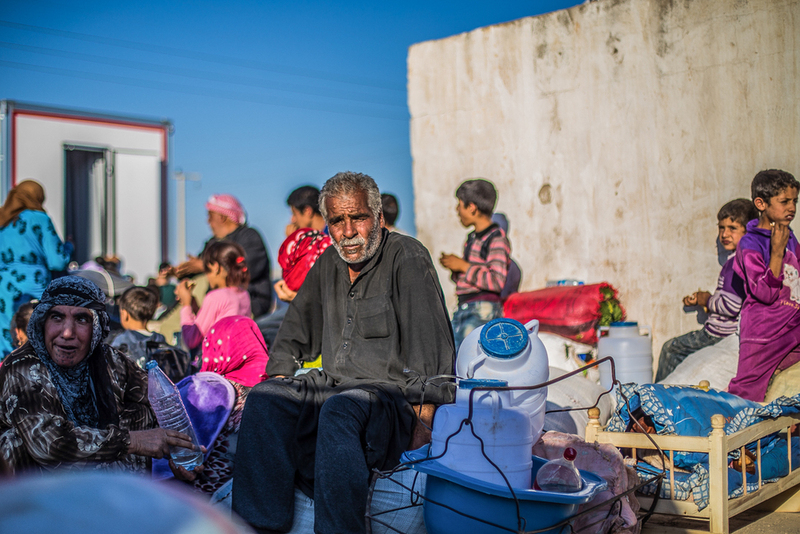 A Syrian Kurd refugee sits in front of tents in the temporary refugee camp in Suruç̧, Turkey. 2014. 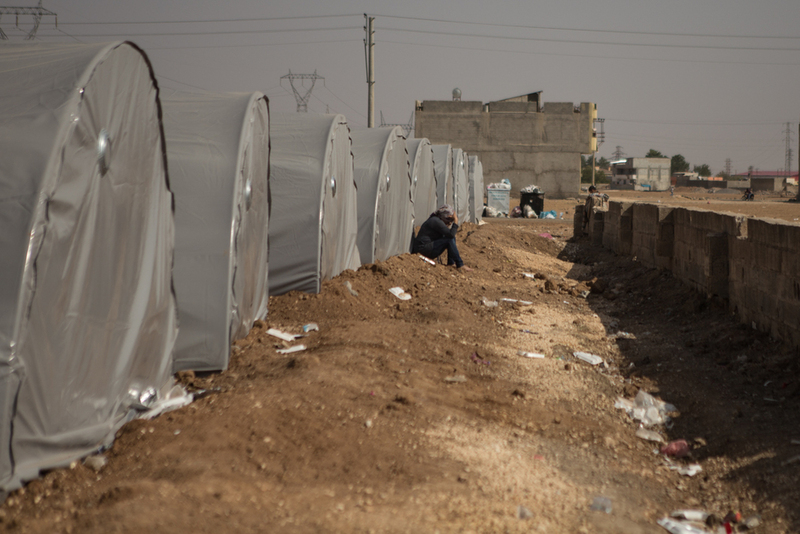 A Syrian Kurd refugee, fleeing the ISIS offensive against Kobane (Ayn al-Arab) in Syria, waits in front of a refugee camp, to be assigned a tent in Suruç, Şanlıurfa Province, Turkey. 2014. Syrian Kurd woman, fleeing the ISIS offensive against Kobane (Ayn al-Arab) in Syria, gather water in Suruç, Şanlıurfa Province, Turkey. 2014. A Syrian Kurd refuge boy, fleeing the ISIS offensive against Kobane (Ayn al-Arab) in Syria, arrive to a refugee camp and wait for a place in one of the refugee camps in Suruç, Şanlıurfa Province, Turkey. 2014. A convoy carrying Syrian Kurdish refugees fleeing the fierce fighting between the Islamic State and the YPG in the city of Kobane /Ayn al-Arab is escorted by Turkish police and military personal in Mürşitpınar, Şanlıurfa Province, Turkey. 2014. A Syrian Kurdish family fleeing the IS offensive in Kobane arrive to the Cultural Center in Suruç, Turkey. 2014. 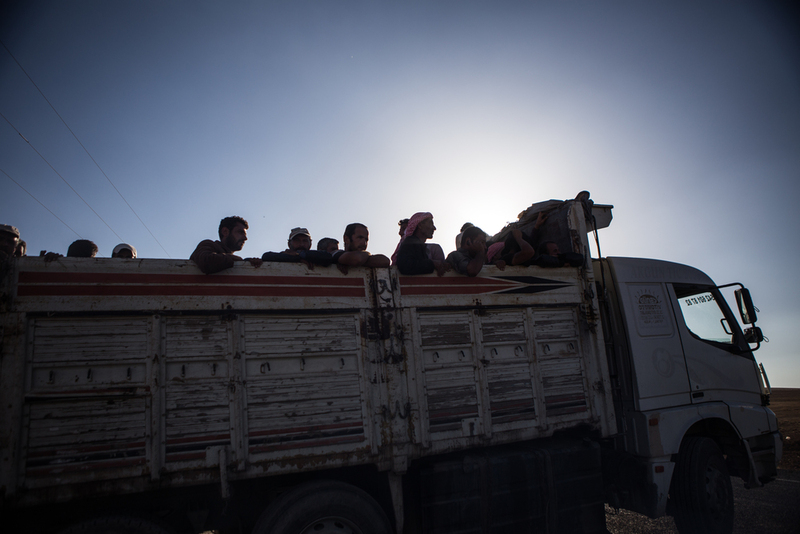 Syrian Kurd men, fleeing the ISIS offensive against Kobane (Ayn al-Arab) in Syria, stands inside one of the refugee camps in Suruç, Şanlıurfa Province, Turkey. 2014. Women wait for the bodies of YPG fighters who died in Kobane (Ayn Al-Arab) and were brought to Suruç,Turkey. 2014. Funeral of YPG fighters, killed in the battle for Kobane (Ayn Al-Arab). Suruç,Turkey. 2014. A woman visits the tomb of a family member who was YPG fighter, who died when injured in Kobane, in the temporal YPG fighter cemetery in Suruç, Şanlıurfa Province, Turkey. 2014. People attend to the burial of a YPG fighter, who died when injured in Kobane, in the temporal YPG fighter cemetery in Suruç, Şanlıurfa Province, Turkey. 2014. Syrian Kurds refugee children, fleeing the ISIS offensive against Kobane (Ayn al-Arab) in Syria, play in the refugee camp in Suruç, Şanlıurfa Province, Turkey. 2014. A Turkish/Kurdish activist sits, in the Turkish/Syrian border in the east of Kobane, where a large group has gathered to support the YPG, in Şanlıurfa Province, Turkey. 2014. Syrian Kurd children, fleeing the ISIS offensive against Kobane (Ayn al-Arab) in Syria, play with masks in one of the refugee camps in Suruç, Şanlıurfa Province, Turkey. 2014. A new YPG fighter’s cemetery, with the ones killed on the battle of Kobane, Suruç, Turkey. 2014.